Garstang FC play their third game in a week tonight with manager Lee Baker demanding his players show pride in their performance levels. The Riversiders host AFC Darwen in their last game before a two-week break in the Hallmark Security League First Division North. Back-to-back losses at AFC Liverpool and Ashton Town leave them ninth in the table with half-a-dozen games left of their debut season at the former North West Counties League level. The two defeats were frustrating enough for the manager but he was especially annoyed at the manner of them. They lost a free-flowing game at AFC Liverpool by the odd goal in seven before squandering a number of chances at Ashton last Saturday and losing late on. “They were two completely different games of football,” Baker said. “The AFC Liverpool game was one where we were punished for individual mistakes at the defensive end and, on Saturday, we couldn’t hit a barn door with the proverbial. “If you make mistakes at the top end and the defensive end, then you don’t help yourself. “We’re going through the motions because we can’t win the league and we can’t get relegated but I do what I always do in terms of preparation. Wednesday sees Garstang host an AFC Darwen side one place above them in the table. 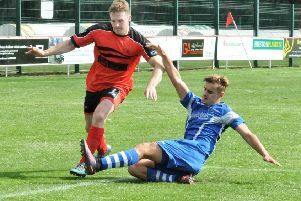 Their visitors won the reverse league game at the end of August but the Riversiders prevailed when they met in the FA Vase three weeks later. Baker said: “They’re in a similar position to us in that they don’t have much to play for.